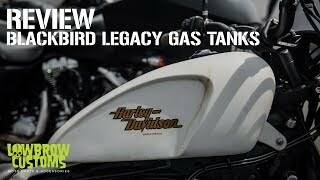 The Blackbird Legacy Gas Tank completely changes the look of your bike, and the best part is, it bolts on right in place of your stock gas tank, no modifications or welding required. The knee indents are reminiscent of early British motorcycles and add a touch of raw speed and class to your moto. This gas tank will work well on most any build, be it a cafe racer, chopper, bobber or just a mild custom. 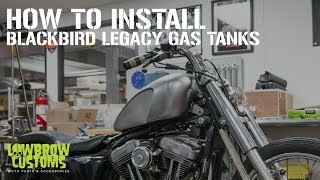 The capacity of this tank is approximately 3.5 gallons and fits 1983-2003 Harley-Davidson Sportster Models. The center mount gas filler bung that accepts a thread-in Harley-Davidson style gas cap and it features a left AND right side bung that accepts a 22mm H-D style petcock (only one petcock is needed, your choice which side you would like to install it on), and also includes a chrome plated cap for the one you choose not to use! Check out the Blackbird Rubber Knee Pads made specifically for this Blackbird gas tank. Reminiscent of the tank knee pads found on vintage Triumphs and other motorcycles they are a nice detail for comfort and to help your bike stand out from the crowd! Solid built, good looking tank! Tank appears to be of solid construction. It passed 3psi pressure test. Does need some clean up before body work and paint can go down. Mostly due to welding splatter and residual weld burn marks. Looking forward to see how the paint accents the indents! width between front tabs/betw. rear tabs/ length on ctr. betw. tabs? Thanks! center to center F-R 14 5/8 "
any idea what it would take to mount to stock 86 fxst frame? The best plan of action would be to have the tank and try it on the frame and then determine the best plan of action for mounting . There are many ways to do this and it is hard for me to tell you what to do with out seeing how it will sit on the backbone and what would need to be done to make new mounting points .